I've had my trusty walking boots for nearly 6 years, but even I have to admit that it's time for a new pair. They quite literally have fallen to bits. I'm in need of a new backpack too so it was off the patch and into the big city for a spot of shopping. From the train we get cracking views of a Buzzard sat on top a fence post and there are plenty of geese on the Birket close to Bidston. But, as darkness falls, there is a birding treat to be had right in the heart of the shopping streets of Liverpool. Just between the Clayton Square mall and Tesco there are a couple of trees. 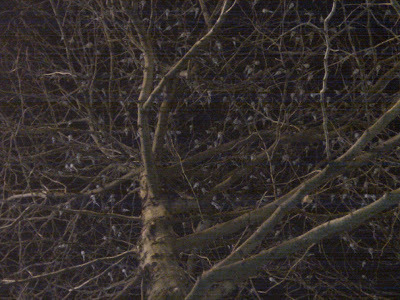 It's here that a couple of hundred Pied Wagtails roost and we were around late enough to get a look at them. There were people zooming past oblivious to the birds above, a guy was having a conversation on his mobile phone unaware of the Wagtails chattering to each other just over his head. Hundreds of people must walk past and never notice them. You see the odd one darting around the pavement pecking at the crumbs of lunches grabbed on the run by busy shoppers, but it was quite amazing to see at least 200 of these birds huddling together in the branches. They must have seen some sights on weekend nights as the pubs and clubs emptied! One day I'm going to take over the proper kit and try to get a few pictures, but today I contented myself with a few frames with my mobile phone. Not a great image, but you get the idea. The light specs are not leaves they are the Pied Wagtails. On the shopping front I got a rucksack, but couldn't find anything worthy of replacing by battered old boots!